Yippee, we have worms again! Not the intestinal kind, but the composting kind, the vermiculture kind – red wigglers. When Christopher was nine years old, we bought a small package of composting worms while travelling through Saskatoon SK on our way home from a holiday. 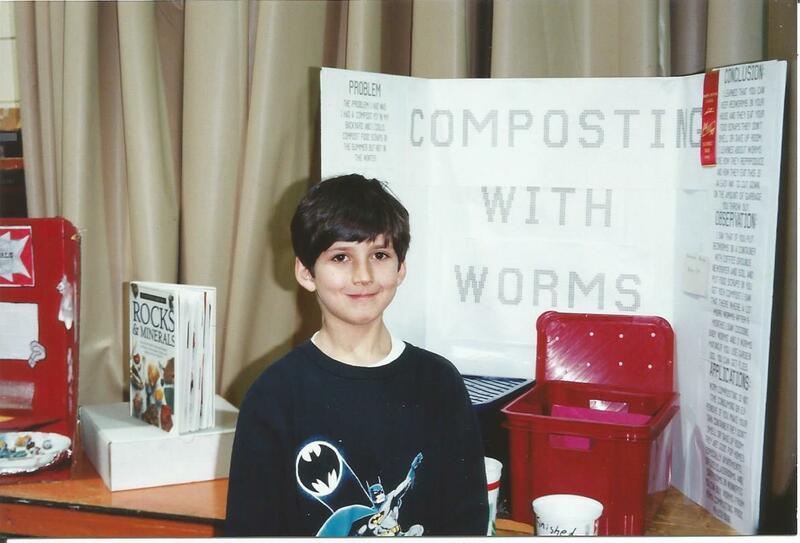 He was about to go into Grade 3, and the worms would be a great Science Project – Composting with Worms. (And yes, his mother was perhaps little too enthusiastic about science projects, and perhaps a tad too over involved. Perhaps.) On getting home, we did our homework and soon our worms were happily reproducing and eating away at our compostables. Besides the Science Project, I also wanted worms to be able to compost year round. Our family of five vegetarians produced prodigious amounts of kitchen waste over the winter, which when added to the frozen compost pile, resulting in a rather stinky heap come melt time in spring. 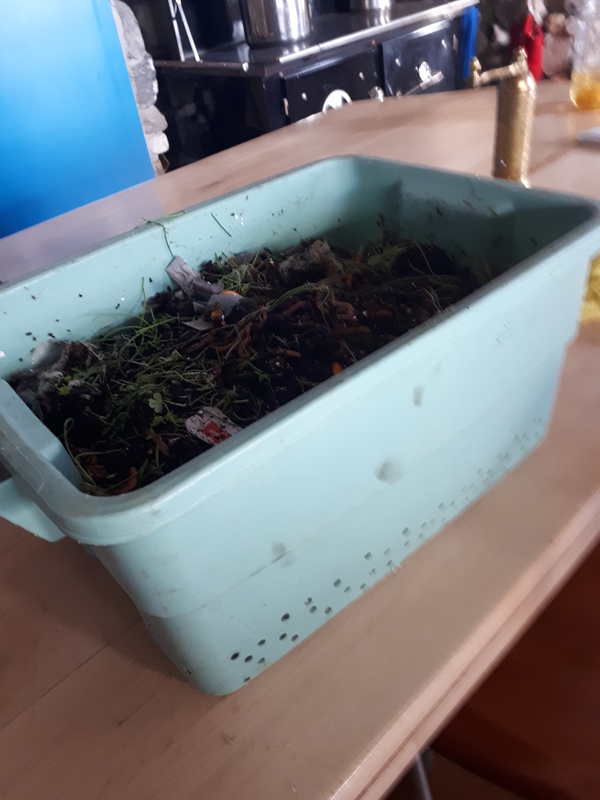 The worms allowed us to compost kitchen scraps inside all year long. The outdoor compost pile was reserved more for garden waste and less for kitchen waste. Over the years, our little vermiculture project grew and grew. It served as a basis for more than that first Grade 3 Science Project. 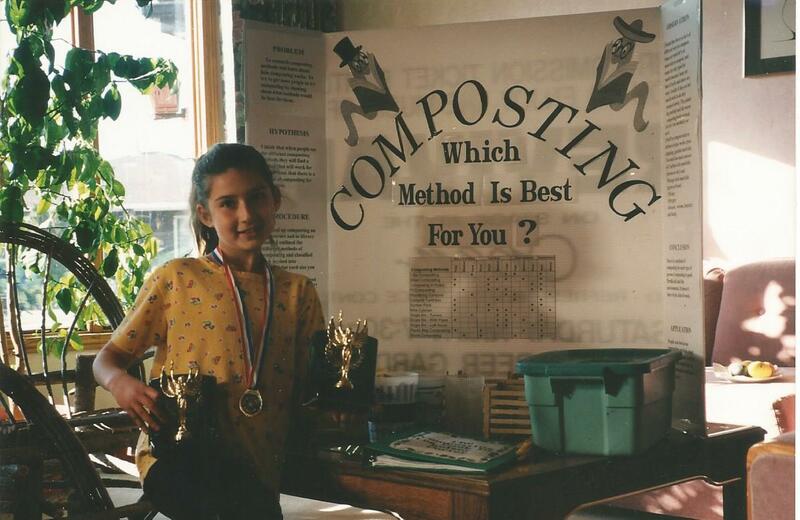 In fact Kelsey went on to be a composting expert, expanding her composting knowledge year by year. 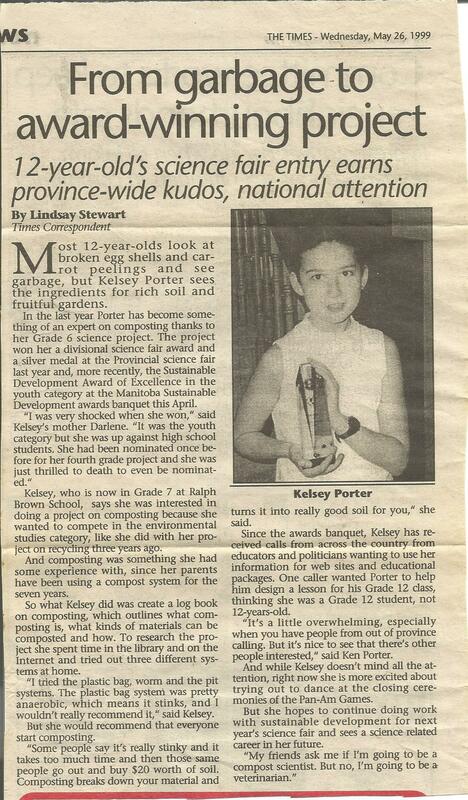 She was the recipient of two Sustainable Development Awards at the Provincial Science Fair. A grand thing for our lowly worms. As our worm population grew, I gave away many a worm composting system to interested friends. Alas, over ten years ago we decided to get out of worms. At the time, we had ample composting space at the Ponderosa. 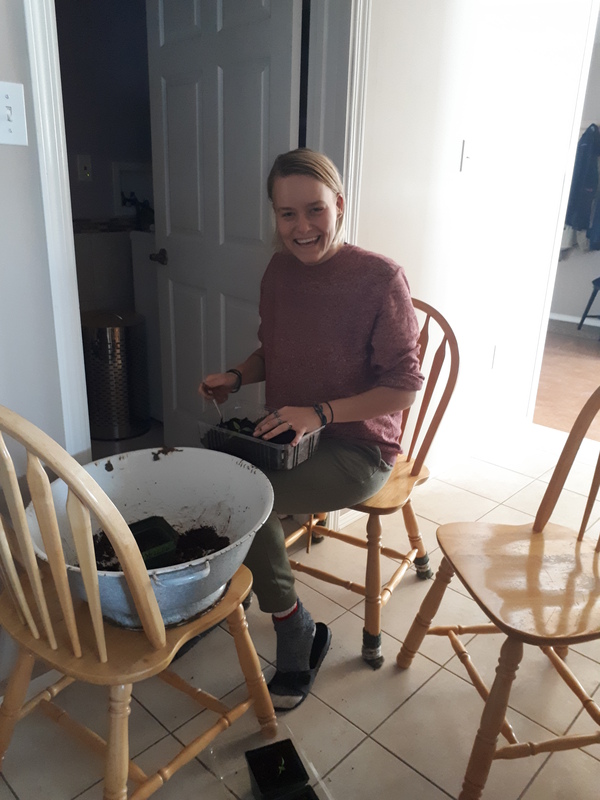 Since we were travelling back and forth from the city weekly, we decided to take the compost to the Ponderosa and get rid of the work of maintaining a worm composting system. A worm composting system is not very labor intensive, but it does take some time to maintain a good worm bed. I can’t say I miss my worms, but I do miss the poo! The worm poo that is. Worm castings are like gold. They are nutrient rich and a great source of humus. They are fabulous for starting seedlings (mixed with potting soil). Since I am now starting all my own seedlings, I decided its time to start making worm castings again. 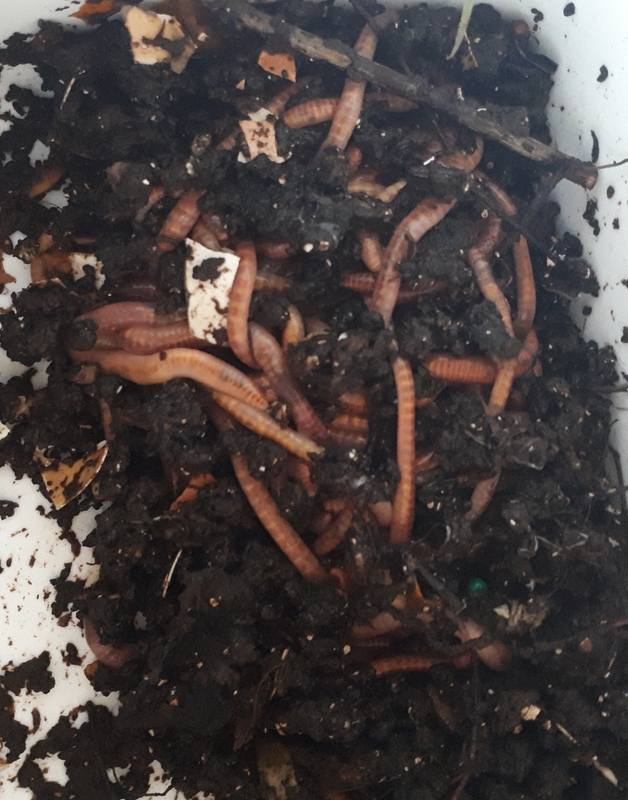 Today, my sister Sheryl arrived with a welcome present – a small tub of red wiggler worms from Amanda (Trevor’s girlfriend, lucky guy to have a girlfriend with worms!). Luckily I still had my worm bins, including a small one used for display at Science Fairs. The perfect size for my new small family of worms. My worm bins are just Rubbermaid containers that have holes drilled on the bottom and around the sides for aeration and drainage. The lid also has holes in it. Then all you need is something underneath to capture any excess liquid. 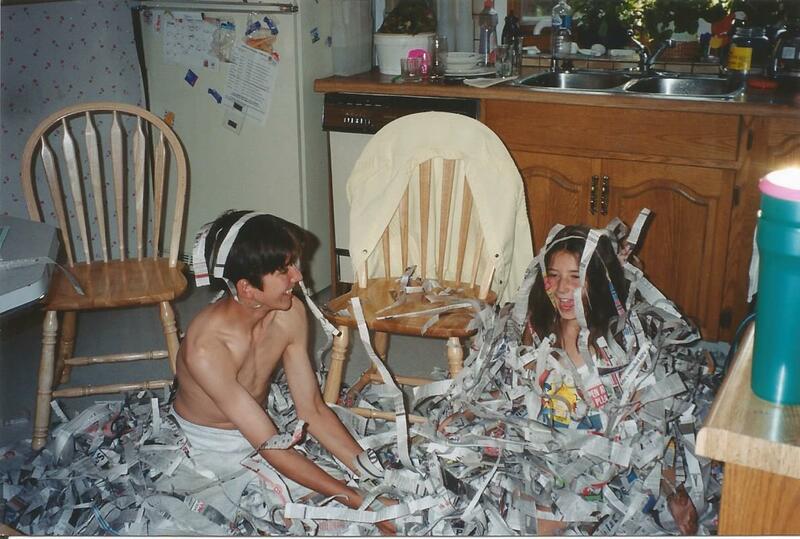 Shred up some newspaper (thanks Ken and Theresa for the ongoing supply of newspaper). This task brought back great memories. The kids used to do this task for me in our kitchen on McInnes Place. 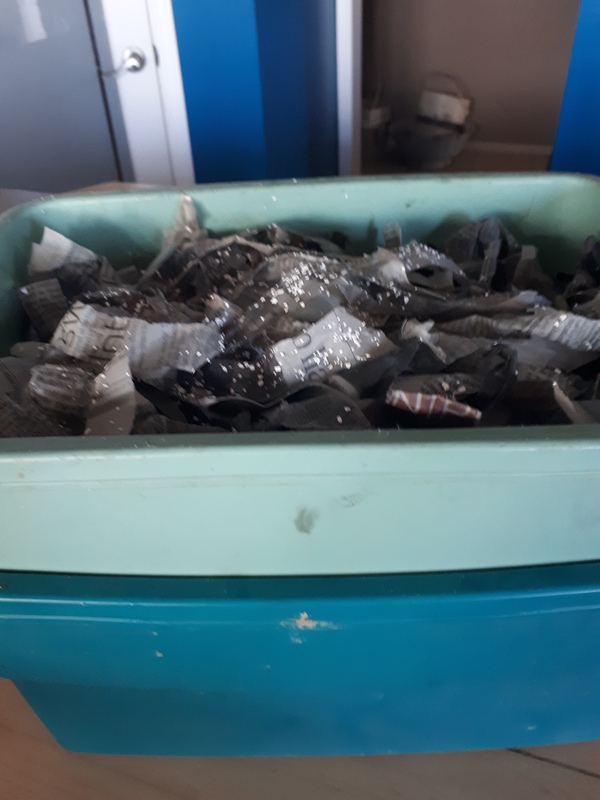 I didn’t meed much today to fill the small container, but we used to have to shred a huge amount to fill to large bins. They had a lot of fun doing it too. Moisten the newspaper until it is like a damp sponge. Fill the worm bed, adding some grit for the worms (they are toothless and need something to help break down the organic matter in their stomach). Previously I used ground egg shells. Luckily Sheryl had some for me. As we no longer eat eggs, I will have to figure out a more vegan option (maybe sand?) or rely on Sheryl for egg shells. On top spread a layer of kitchen scraps. I emptied the contents of my compost pail into the food processor to create nice finely chopped organic matter as a special welcome treat for my new house guests. While they are getting established I will try and keep their food finely chopped so that they can eat more, poop more and reproduce as fast as possible. Lastly, my lovely worms were added. They wasted no time burying into moist bedding to escape the light. As an active worm bed produces a fair bit of liquid, I placed the container inside another similar container without drainage holes. As the bed gets too damp, I will add dry shredded newspaper to absorb some of the water, keeping liquid runoff to a minimum. 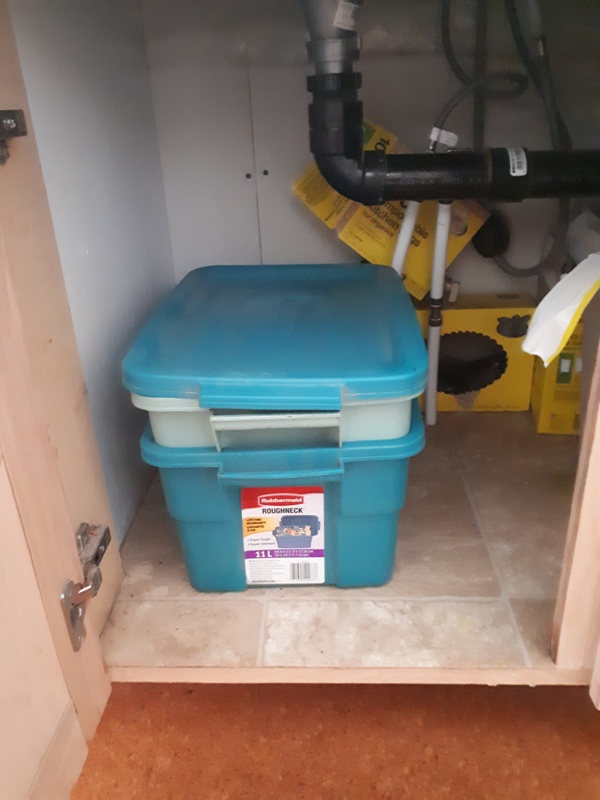 My worm bed is safely tucked away under my kitchen sink, as my basement is too cold for them. They prefer a temperature around 18 to 22 C. When they outgrow this small container, I will get Ken to build me one to custom fit this space. 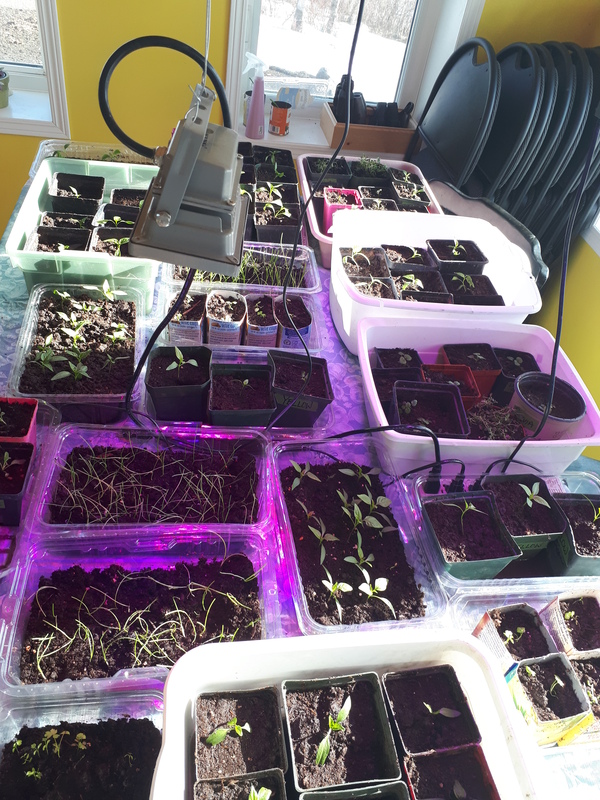 In the meantime, my seedling starts are doing fine in the sunroom with added light from grow lights. We repotted some this week (peppers, sage, thyme, celery, stevia and lemon balm), using a mixture of soil from my garden and worm castings from sister Sheryl’s worm bin. The tomatoes, eggplant, watermelon and cantaloupe were planted this week but have yet to germinate. Next week I will start the brassicas. I can’t wait for the grandkids to meet my worms. Hmmm, maybe they will be interested in doing a Science Project with Baba. A whole new generation to work with! This entry was posted in Family, Gardening and tagged red wigglers, science project, vermiculture, worm composting, worms. Bookmark the permalink. 1 Response to We Have Worms! I got worms when I first moved to Vancouver. They lasted 7 years before they died in a cold winter on the balcony and I never replaced them because we have citywide composting pickup now. I hope yours do well.